Eating Disorder is not a new issue but yet, I feel like there's not enough conversation about it. Personally, I've never experience it, although there was one phase I didn't like how I look, how my body was. To be able to overcome such a negativity that I had, is probably one of my biggest achievement. Back then, I didn't tell anyone, I just kept to myself because I was so embarrass about that. Right now, I am a working progress. I'm accepting what I have, working toward more positivity than things that I can't change, because I am perfectly imperfect this way. Few months ago, I watched a trailer on Netflix youtube channel. To The Bone, starring Lily Collins and Keanu Reeves. The trailer was pretty self explanatory at that time but what made me really interested and looked forward was how true the story was since the beginning. There are so many times we've been fooled by movie trailers (not gonna talk about that, so upsetting) but I knew this trailer was not. There were conversation about this movie - pro and contra, how people were looking forward because "it looks promising" and the fact that the writer and director, Marti Noxon and Lily herself are both have the same experience about eating disorder in the past and they wanted to share this story to the world. But of course, some people were worried and even upset for no reason (because the movie hadn't come out yet) said that this movie would glamorizing eating disorder just like the others. I am not a person who believe what people say unless I see it myself. So here's my honest thought. Last night, I finally watched the movie. Learning from my experience with movies about eating disorder (which I find really wrong), I didn't put many hopes in this movie. Although Reeves and Collins are both my favorite actors but you know, sometimes it happens. The first scene really got me - the story was like, slowly pulling me in. Like I said, I didn't have eating disorder, I did hate how I look, I once hated my body but I learned to accept it. It's different. So, in five minutes, this movie pulled me in deeply. 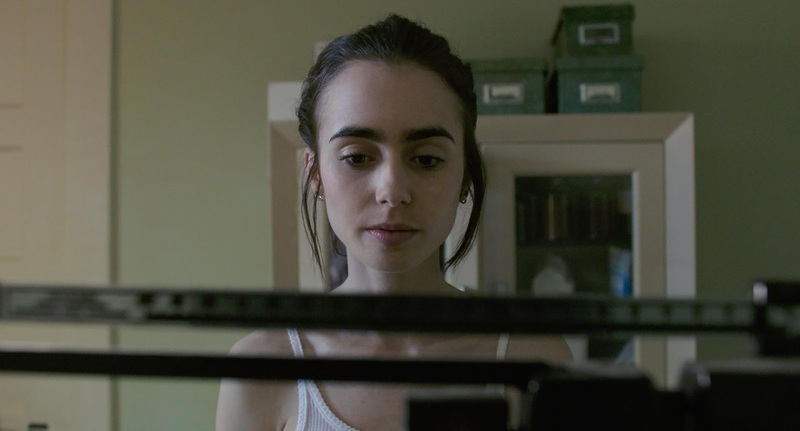 It felt like I have the same experience with Ellen (Lily Collins), it felt like I am Ellen: how I really obsessively restricting what I eat, keep measuring the size of my arms and insisting that I have everything under control, that I will be okay although I am actually a living skeleton. I am bone from head to toe. I love this movie. I really do and also makes me cry a lot. From my perspective, this movie doesn't glamorizing anorexia at all. Instead, it shows us what anorexic looks like, how they behave, their point of view and more than themselves, this movie also shows us what anorexia does to their family or closest people. The story is so good, like hitting the right not. So well written, well acted, well directed. As an audience, I really understand now about eating disorder without making me feel triggered or scared. What I feel afterward is just like when I learn about space or milky way which are my favorite topics to talk about. It feels like I want to join the conversation, wherever it is. I want to give my personal opinion as a person who used to not fully understand about anorexia or eating disorder in general, about depression and anxiety, about OCD. The best way I can explain is, like learning in a fun way about deep and dark topic. I am so blown away with Lily Collins - she portrayed Ellen so greatly, I knew from interviews she really did losing so many weights for this role and that wasn't made me respect her even more because there are so many actors did that, lose their weight for certain roles, dying their hair, and other stuffs but the fact that she put herself back to where she was before. I can't imagine how it feels like to going back to the phase you have overcame. The phase you practically didn't want to go back. I can't imagine other actress played this role. Like Ellen was made for her, that Lily has to be the person to tell her and Ellen's story. Keanu Reeves is no doubt great as a doctor who helped Ellen in a unconventional way. I love him so much, not even kidding. He always put his best on whatever role he has and stay true to the character without overachieving it and makes it fake - if it makes any sense. Lili Taylor is also giving such an impressing show - I feel like she's underrated actress. Her way to portray Judy, Ellen's mom is impressive. I'm not a Mom, but as I said before but I can feel their stories and feelings. It's brilliant! To The Bone is such a beautiful, heartbreaking and deep story. It is a gorgeous achievement. I can't even be more thankful than I am right now, to learn so many things from one movie, and even can feel related to this one even though I don't have the same phase, I feel grateful for this story. I really want everyone to take their time to watch and appreciate this movie, to open their mind up, to add more perspectives to see people and world in general. I hope we can understand that sometimes enough is all we can do.